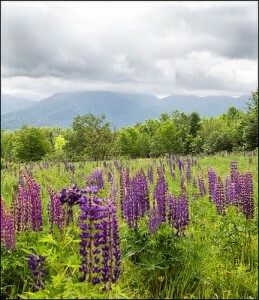 This will be my 6th Lupine Festival. Every year, like magic, the beautiful wildflowers spring to life in June just in time for the Festival. But there is much more to it than just beautiful blue wildflowers. It is a celebration of spring. At the Sugar Hill Inn, the pool has now been open for several weeks and the window boxes have been planted. This time of year I love sitting by the pool with my morning coffee listening to the water fall while gazing up at Mount Lafayette. To get the most out of the Festival it is important to have a copy of the Lupine book. We give them free to all overnight guests. If you are a day tripper, they are for sale at the welcome center in Franconia and at Harman’s cheese in Sugar Hill. The book has a map of all the great viewing places plus a listing of all the special events and recipes from the area’s country inns. The book is so full of discounts and special offers you will recoup the $5 fee many times over. Many of the local businesses and Inns sponsor special events. At the Sugar Hill Inn we chosen to do cooking workshops and wine tastings because culinary adventure is at the heart of who we are. If you love beautiful homes and great views, tour the “Most Energy Efficient Home in NH”. The details are in the book. I am also drawn to the festival by the local arts and crafts. I am particularly interested in seeing the new original water colors by Debbie Aldrich. The Sugar Hill Inn is proud of its role as a patron of the local arts and owns two of Debbie’s originals. Her work will be available for viewing and purchase on the lawn at Polly’s Pancakes each Saturday from 10am to 2pm. I also recommend the Arts and Crafts show on June 4th and 5th. Two years ago I purchased a beautiful painting by Adrien “Yellow” Patenaude and it is on display in the Wildflower Cottage Room. I am looking forward to seeing his new works. From Franconia, I recommend driving up Route 117 into Sugar Hill. The town of Sugar Hill is known for its mountain views, beautiful homes, tranquil farms, New England Churches, wildflowers and country stores. The Sugar Hill Inn will be the first place you will see on the right hand side. The inn began as a farm house in 1789. A little further up the road on the left hand side is large farm with beautiful mountain views. Be sure to stop for a picture. At the corner of Lovers Lane read the historic marker about the first ski school in America. Keep going up the hill and on your right will be the famous and award winning Polly’s Pancakes, the perfect stop for breakfast or lunch. Continue up 117 passing St. Michaels, a very popular small wedding venue and turn left onto Sunset Hill Road. The views from here are spectacular. The big red barn is a gift shop and museum. This is the perfect place is stock up on NH Maple syrup and learn about the good old days of New Hampshire’s grand hotels. 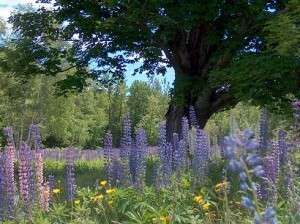 This is also the starting point for the horse drawn wagon rides thru the Lupine field. Continue West on Route 117 for about a ½ mile more to the town center. Don’t blink, you might miss it. Here you will find the Sugar Hill Museum, Town Hall, the Sugar Hill Meeting house and Harman’s, the country store made famous by its aged cheddar. Many of the Lupine events will take place here including Open-Air Market on June 11 & 12: The open air market the following weekend will be in Franconia. Be sure to check the program book for all the events and times including free concerts. On your way back to your motel or inn I recommend that you lose yourself on the back roads of Sugar Hill. I highly recommend Lovers Lane, Pearl Lake Road and Easton Road. To top off the day’s events I recommend a good dinner. For ideas I recommend you read my blog post on the Best White Mountain Restaurants. 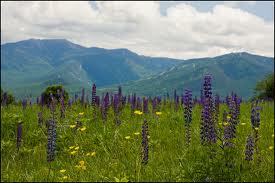 Please feel free to post about your Lupine Festival Experience. I think of myself more as an artist then a business owner and the Sugar Hill inn is my canvas. In this blog I am going to talk about the art of inn keeping. This blog should be of interest to anyone interested in travel, hospitality, design, art, fine wine and food, the White Mountain, environmental issues and enlighten business management.